Regular oil analysis is essential to a successful lubrication and maintenance program. That is why Isel is proud to offer POLARIS Laboratories® oil analysis as a free service to all customers. This program is designed to enable your technicians to have a powerful impact on your revenue and the customer relationship. All Isel & POLARIS Laboratories trademarks are the property of their respective owners. Isel’s designated laboratory partner, POLARIS Laboratories®, is a full-service fluid analysis laboratory delivering unprecedented levels of quality in fluid testing. See polarislabs.com for more information. Oil analysis test kits are ordered directly from Isel and are free of charge. Kits are ordered in sets of ten. You may order more than one set at a time. To order call 1-800-503-9533 or contact us with the number of sample kits you need. Our knowledgeable technical support team will be there every step of the way with expert product support. NOTE: If you have any sample kits from before August 29, 2016, please continue to send those to Isel as on the sample kit instructions. When your new kits arrive, those new kits will then go to POLARIS. If you have both kits, please use the POLARIS kits. Submitting old Isel sample kits to POLARIS may cause delays in receiving results. HORIZON allows you to register individual components (equipment) into their system to improve accuracy and help with faster processing. Providing as much detailed equipment and oil sample information as possible ensure more accurate flagging limits set by Isel support experts. If you have any questions on flagging limits or sample analysis, please contact Isel technical support. 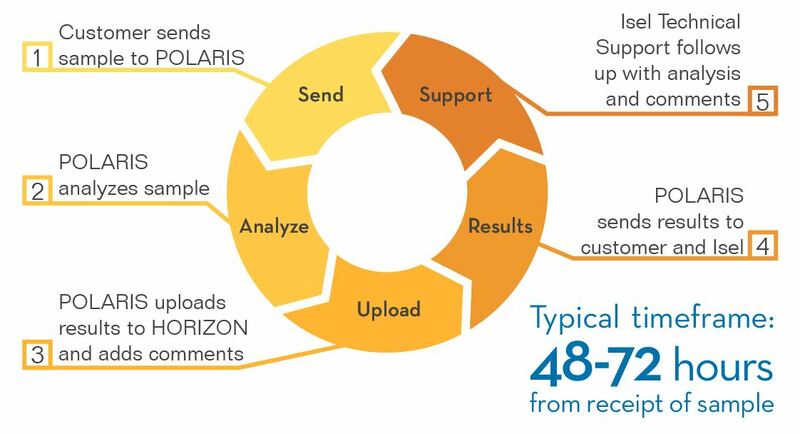 Need help navigating HORIZON and the sample submission process? Call your Isel representative or contact us and we will be happy to help walk through any of your questions. You may also download additional HORIZON training in their Technical Library, available after you log in. After POLARIS completes analysis, the results will be reviewed and commented upon by POLARIS. An Isel analyst will continually monitor all results and will contact you directly to discuss any flagged samples.